In “The Basics” we already established that the horse can feel safer and have more fun being close to you in a field. He doesn’t have to look out for his safety or where the food will come from because you have done that for him. Now we turn to the most important part of the horse-human communication–resource management. 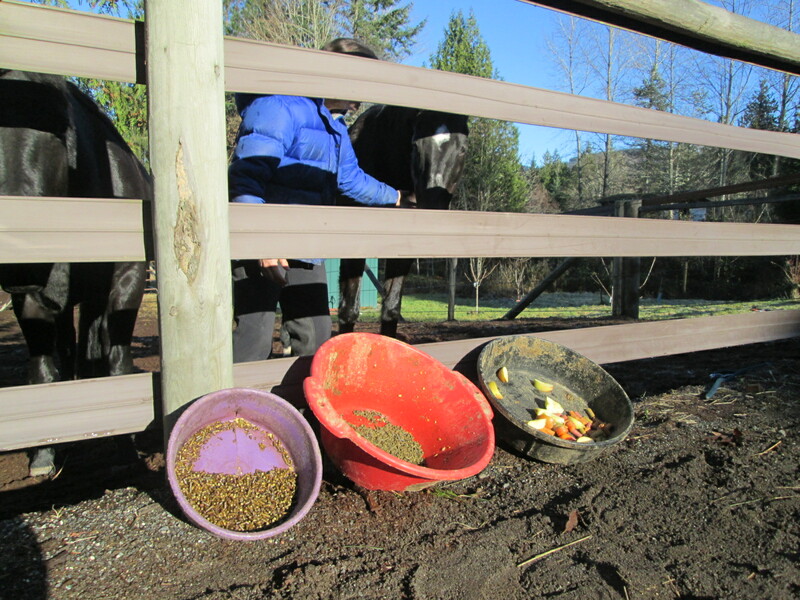 For most horses, resources include special food–sweet grain not fed otherwise, pieces of carrots or apples or pears, other highly prized treats. Since you are establishing new rules around these treats, your horse could get mad at you at first. Please be careful: horses can hurt you and people have been killed by horses for less than a treat. If you do not know the horse, please ask for professional help in training him. Resources humans control can include special food but there are many types of resources: scratching them in a special spot on their withers or under their belly during itchy insect season. For a cribber, it could be a special pole to chew and grab on to; For a stallion, it could be a mare in heat. In the wild, it might be a water hole. Some horses like their human so much, just being verbally rewarded or softly stroked on the neck is a fine resource. One thing that is very important with food is in general you can’t give carrots and apples or other special goodies for free. You are no longer a candy bar dispenser; this horse must see you as someone they need to please in order to get the special food. Of course, they should have access to roughage or hay all the time. Here at the farm, I use food items that are not normally in my horses’ diets. I cut up pieces of carrot and apple as well as molasses-covered grain the horses go crazy for and just fill the bottom of their food pans. I like to use one food pan just for training. I leave this food outside the gate in what Robin Gates calls, “the cookie bar.” When the horse does something I want to reward, I grab one of these items from outside the gate and allow him to eat a few mouthfuls. Nothing sends a better message than that! The smorgasbord of horse delights! Pieces of carrots, apple, grain all safely behind the fence so your horse needs to go through you! Eventually, after using Georgia Bruce’s “head away” technique in her video, “Click with horses,” even with a previously food-aggressive horse, I can fill my hip pouch with goodies and the horse will not maul me for them. If the horse learns he will not get food unless he earns it, and that he has to turn his head slightly away from you to get food, you are on your way to managing the resources safely. With my pushy mustang, the chestnut Mick, I had to go further, and put the food in a pan to give it to him. I could not feed him directly by mouth because then he associated my fingers with his hard-earned snack. Later on, you can leave a pan of food in the arena, and lead the horse at liberty away from that food. This is the level of resource management we need, in many cases, to stay safe around these big potentially dangerous animals. Now your horse will respect you and see you as a leader they can trust instead of a whimpy person they can bowl over that just caves in and hands them a carrot.